This might be the best afternoon of your life. 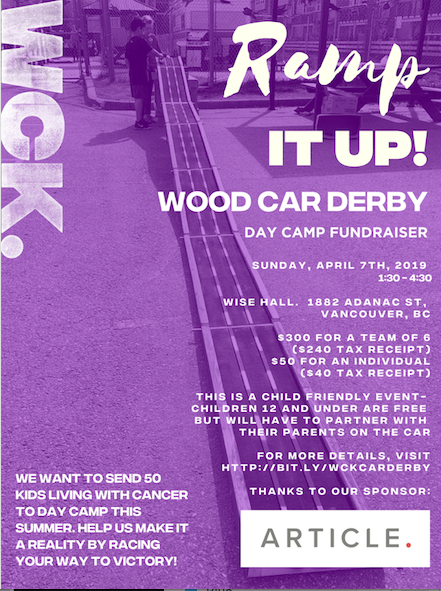 Build a car (boy scout style), race your car, bet on your favourite car and win raffle tickets for amazing prizes! Teams will join together to design 3 cars to race against other teams. Want to ‘soup up’ your car? There will be light woodworking tools, painting and styling equipment, and the option to strategically add *weight. All cars will go through a time trial and the fastest cars will move onto the finals. Purchase raffle tickets and bet on cars.